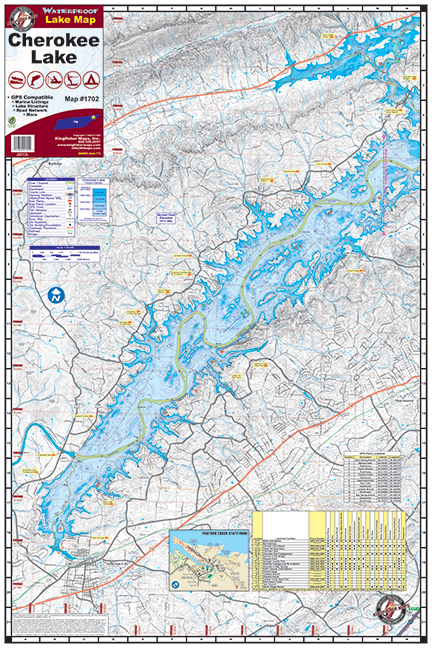 Lake Cherokee #1702 – Kingfisher Maps, Inc.
Cherokee Lake 24″x36″ Two-sided. Waterproof and Tear Resistant! Cherokee Lake is one of the oldest of the TVA reservoirs. Construction on Cherokee Reservoir Dam was begun August 1, 1940 and was completed December 5, 1941. The dam is 175 feet high with a length totalling 6,760 feet. Cherokee Lake covers 30,300 acres at full pool, is 59 miles long, and has 463 miles of shoreline attracting over 2.5 million visitors annually. It collects water from a 3,428 square mile watershed. Cherokee Lake is shared by Hawkins, Grainger, Hamblen and Jefferson Counties. The three major towns surrounding Cherokee Lake are Morristown, Jefferson City, and Rogersville. Flood stage elevation for Cherokee Lake at summer pool is 1,073 feet above sea level, with a winter pool of 1,030 feet above sea level. (Range of 40 to 45 feet.) Fish densities in Cherokee Lake are greater than most of the other TVA Reservoirs due to the high level which results in a dense forage base of Threadfin Shad, Gizzard Shad, and Alewife. A variety of fish attractors have been constructed over the years in an attempt to improve fishing for anglers. These include brush piles which are used by many game fish, and stake beds which are used primarily for concentrated crappie. The TVA has also planted Willow, Swamp Oak, Bald Cypress and River Birch in drawdown areas to create additional long lasting habitats. Cherokee Lake is known for its Striped Bass fishing, but also offers Black Bass, Crappie, Walleye, Sauger, Sunfish, White Bass and Catfish. Large Mouth and Small Mouth Bass are not stocked in Cherokee Lake because of their great abundancy. 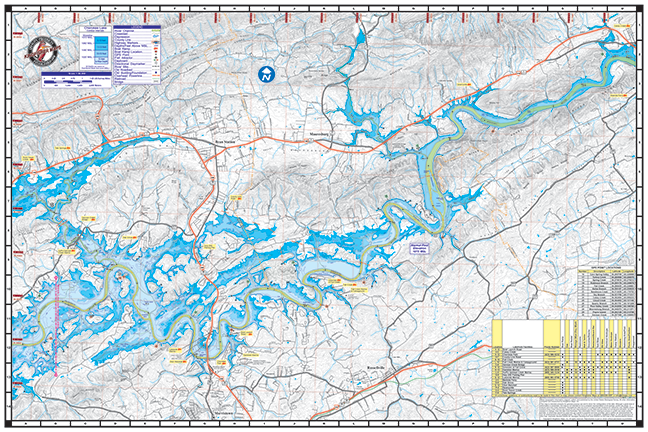 Of all the TVA lakes tested, Cherokee Lake has the highest score for large mouth bass.